This week started for me with an allergy induced head cold and a very sore throat. I also lost my voice for the first time in my life. 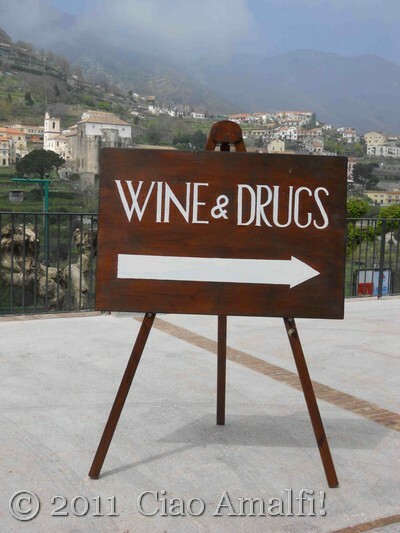 I had to laugh – even though it hurt – when I saw this sign for a new shop in Ravello. Must admit that at the time it didn’t sound too bad! Wishing everyone a happy, healthy and fun weekend ahead! Last week on Venerdì Santo, or Holy Friday, it is the traditional day for the Processione del Cristo Morto, a mournful procession representing the carrying of Christ after he has been taken down from the cross to his burial. Usually, a statue of Christ’s body laying on a bed is carried followed by a statue of the Virgin Mary dressed in black and weeping for her lost son. The processions take place after dark and often only by torch light, and are some of the most moving religious expressions I have experienced here in Italy. Last year I witnessed Amalfi’s impressive Venerdì Santo procession, but each town on the Amalfi Coast has its own traditions. To see something different this year, we decided to see how Holy Friday was celebrated in the towns of Ravello and Scala, high up in the mountains above Amalfi. 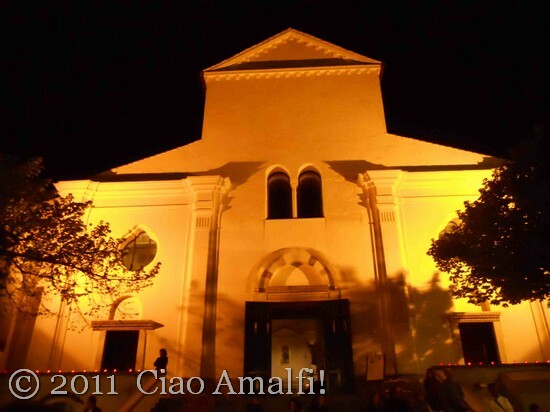 The Duomo of Ravello was striking, lit up against the black night sky. When we arrived the procession had already left the Duomo and was making its way through the stepped walkways of Ravello toward the Church of Santa Chiara near the Villa Cimbrone. We could hear the deep voices of the male choir and the marching band echoing through town. We crossed the Piazza Duomo and headed toward the procession, which we met just as it arrived at the Church of San Francesco in Ravello. Here is a video of the procession as it was leaving the church where you can see the statue of Christ and the Virgin Mary. Listen to the deep male voices in the choir. I’ve never heard anything like it on the Amalfi Coast, and the tour guide said it reminded him of processions he saw when he was working on the island of Sardinia many moons ago. We followed the procession as it slowly made its way back to the Piazza Duomo, accompanied by a mournful song played by a marching band from the Vallo di Diano down in the Cilento. The procession continued its long path to the other end of Ravello, but for us it was time to hop in the car and cross the Dragone Valley to see what was happening in Scala for Venerdì Santo. 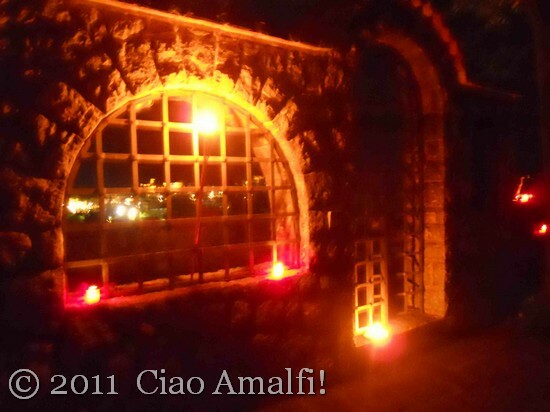 The doors to the huge Duomo of San Lorenzo were open and the light flooded out into the dark piazza. All around on every ledge and windowsill were little red candles – the only lights in the piazza and along the streets of Scala. The photo below is a little out of focus, but it does capture the feel of the red lights against the old stone buildings. Across the valley we could see the lights of Ravello, and the sound of the procession making its way through Ravello echoed all the way from the other side of the valley. Here is a video of the procession leaving the Duomo of Scala and leading to the Church of Sant’ Alfonso, where it turned around and returned. 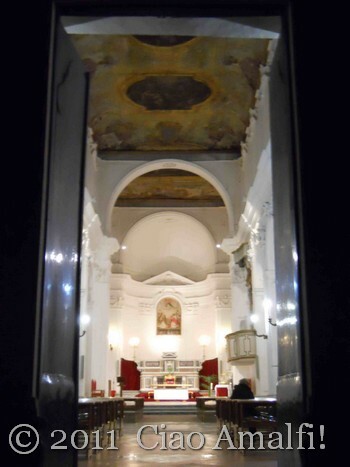 You can hear the church bell in Scala … it was 9:15 PM if you’re counting! Here is a video of the procession returning through Scala where you can see the statue of Christ and the Virgin Mary better. The Vernerdì Santo procession in Scala was very simple, but in its simplicity was one of the most beautiful. There was no marching band or crowd of tourists, just the people of Scala carrying on a religious tradition that has been celebrated here for centuries. I hope everyone had a lovely Easter weekend! And, if you celebrated in Italy, I’d love to hear about Venerdì Santo and Pasqua traditions in other areas of Italy. Next year I plan on visiting Minori for Venerdì Santo as I’ve been told that they light candles on the sea along the beach. I love discovering these traditions in Italy and seeing how much they vary from one village along the Amalfi Coast to the next! 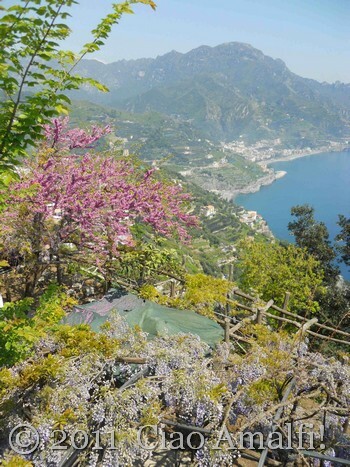 After a couple of years of rainy and cold springs, the Amalfi Coast is finally having the mild and beautiful spring weather that it’s famous for. The wisteria has been blooming for weeks already along the coastline, and I’ve been enjoying its sweet scent filling the air. 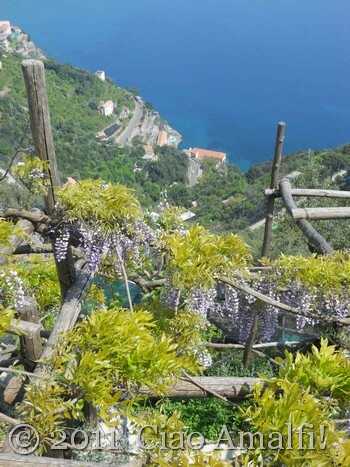 While the wisteria in Positano peaked about two weeks ago, the cooler temperatures up in the mountains of Ravello means that the wisteria blooms a little later there. 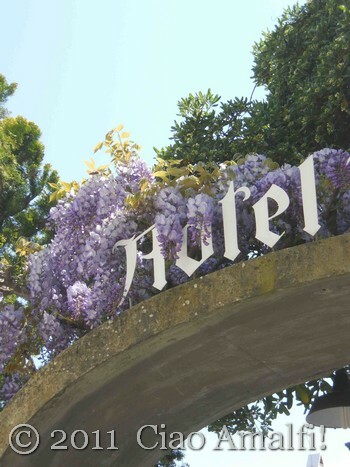 I’ve been in Ravello quite a bit recently, and I’ve found wisteria blooming all over the town, from little trellises covered with vines to luscious clusters of flowers decorating the walls and signs. 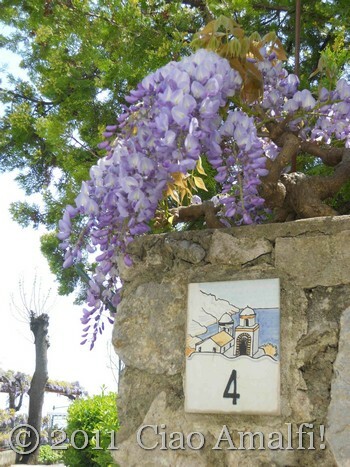 Here are a few springtime views of wisteria in Ravello. Enjoy! 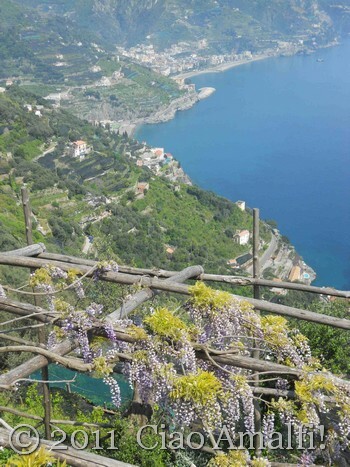 There have been many special events taking place in Amalfi over the past week for la Settimana Santa, or Holy Week, leading up to Easter this Sunday. Pasqua (Easter) in Italy is an important religious holiday, and almost every town—small or large—has events for Venerdì Santo (Holy Friday). 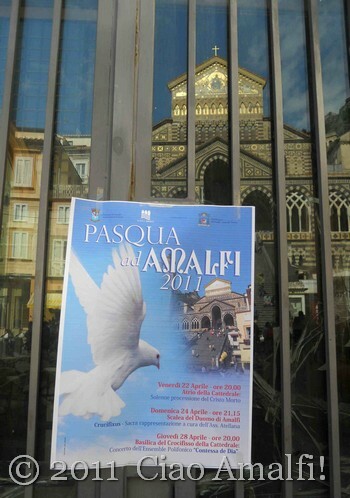 For more information on Pasqua in Campania, including videos of last year’s Processione del Cristo Morto in Amalfi, head over to Charming Italy to read the article I wrote on Easter in Campania. I’ll be at the procession this evening, hoping to get some better shots and videos on my new camera to share here on Ciao Amalfi. Wishing all of you a happy and peaceful Easter weekend! 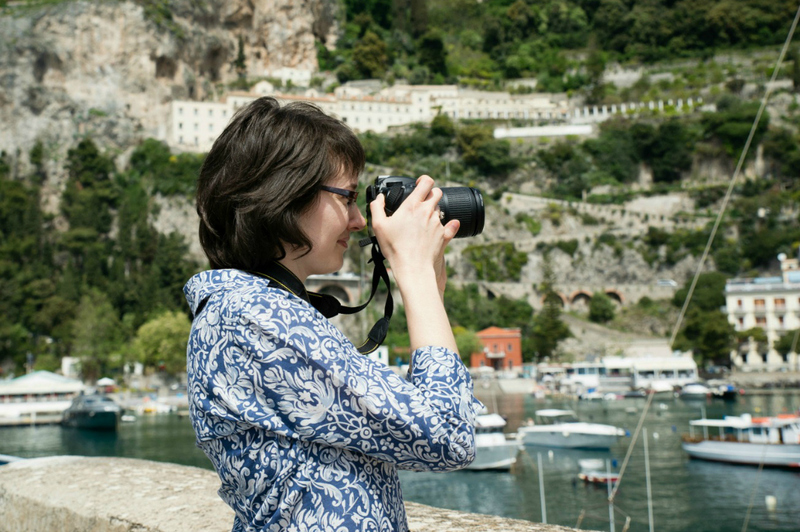 When I first started spending time on the Amalfi Coast years ago, I wondered often about where the locals bought certain things, such as plants or any number of household items from sheets to slippers. All those questions were answered the first time I visited the mercato, or market, in Amalfi. Every Wednesday morning trucks arrive in town and set up stalls selling just about everything you can imagine – shoes, clothing, kitchen supplies, fabrics, fish, fruits and vegetables, olives and, yes, even slippers! 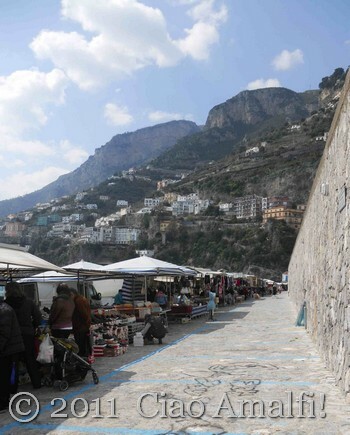 Anyone who has ever hiked up to the market in Amalfi, which was located way at the top of the town, will remember the walk. Just when you thought you’d never get there, you’d see a truck selling mozzarella cheese and then the first stalls set up around the next curve in the road. While I was in America last month, an old building near the market area collapsed, and the market was temporarily moved to the long parking area behind Amalfi’s port where it was located many years ago. 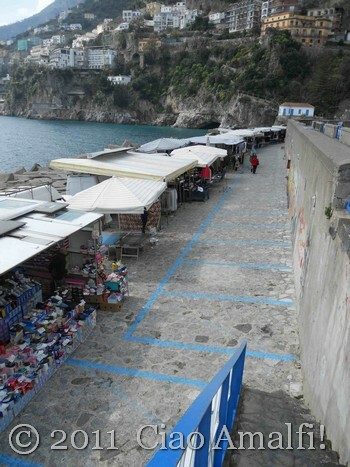 The area at the top of town has yet to be cleared for the market again, so for the time being it will be held in the parking area in Amalfi. For visitors to the market, this is a nice change! Before the stalls were located in a narrow road where cars and scooters had to squeeze past shoppers. I’ve been bumped by a car before when I couldn’t move out of the way in the tight space fast enough. Now you can walk along the stalls peacefully, without having to worry about being run over. Always nice! The market is now located in the part of town that the Amalfitans refer to as “dietro al porto,” which means “behind the port.” This large pier is what defines the harbor of Amalfi, and it’s also one of the favorite spots for a passeggiata, or walk, in Amalfi. So now on Wednesday mornings you can enjoy a stroll along the port while doing your weekly shopping! 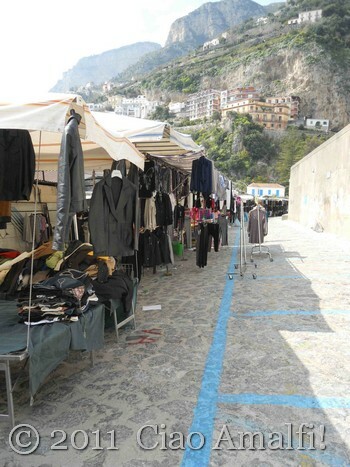 Weekly markets like the one in Amalfi take place in different towns along the Amalfi Coast. 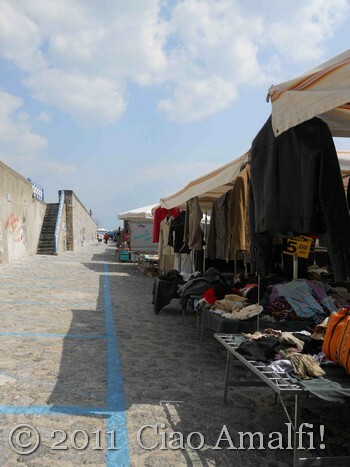 On Tuesday mornings you’ll find the mercato in Ravello located in the two level parking area below Piazza Duomo. On Thursday mornings the market in Minori is set up along the waterfront. The largest weekly market on the Amalfi Coast takes place in Maiori on Friday mornings, and can be found by following the main road called the Corso Regina toward the top of town. The markets are generally set up by 8am and close down by 1pm. Even if you don’t find anything you need to take home with you, visiting the mercato is a great way to experience a bit of daily life on the Amalfi Coast.